This time last week was a day Bitcoin Core developer Luke-jr would rather forget. 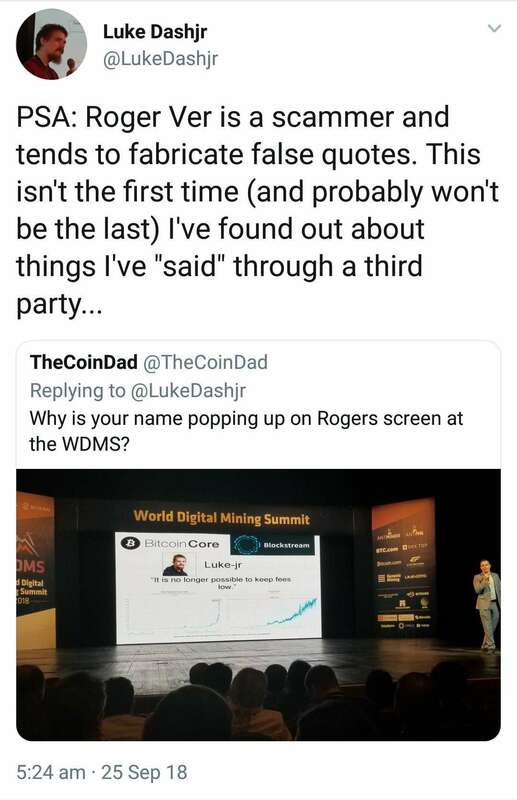 It all started when the Core developer took note of a tweet by @TheCoinDad asking him “Why is your name popping up on Rogers screen at the WDMS?” This was of course, during a Roger Ver talk at the World Digital Mining Summit where we had the below image on display. The slide during Roger’s presentation attributes the quote, “It is no longer possible to keep fees low,” to none other than Luke. It’s not the first time this quote has been used in a Roger Ver presentation, and there are interestingly numerous references scattered across the internet concerning it. While Luke’s supporters jumped the bandwagon in support, some other users were quick to do their own research, and were quick to point out the very source of the original comment made by Luke. What’s more interesting is that the quote was verbatim, and none of it was taken out of context. As evidence mounted, shortly thereafter, Luke ‘Dashjr’ deleted all evidence of the tweet, and issued no apology to Roger for his premature outburst.